The 1980s - a simpler time before social media, smartphones and most things digital. The world was still, by and large, analog. Radio communications were simpler too.VHF low band, the segment between 30 and 50 MHz, was still home to police, state patrols and fire departments. It was cost effective and covered a wide geographic area without the need for repeaters. Best of all for hobbyists, the signals could sometimes be heard hundreds or thousands of miles away. These signals, especially during the summer, tend to reflect off the ionosphere and land half a continent away - great for scanner listeners but a real nuisance for radio users who had to put up with the interference. "You need to repeat. You were covered by skip," said many frustrated dispatchers over the years. For some of us, this was fascinating stuff. 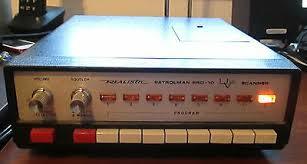 In the summer of 1985, I began tape recording audio from a Bearcat scanner connected to an outside antenna. Recently, I found one those tapes, filled with transmissions from the 39 and 42 MHz bands. Considering the age of the tape, the sound held up pretty well. I converted the audio to MP3, and in order to share it here and on YouTube, I had to create a slideshow. (YouTube doesn't support audio only.) This is 19 minutes of exciting sound. There are sirens and southern accents and dispatchers frustrated by lost transmissions. About nine minutes in, there is a casual chat between two ham operators in Missouri, followed by transmissions from the Connecticut State Police, which operated on 42 MHz at the time. If anyone can decipher where these police departments were located, please let me know. Sorry for the sketchy slideshow. I never really mastered the Movavi Video software, but it's not bad for a first attempt. "At the tone, 18 hours 37 minutes, coordinated universal time...BEEP, tick, tick, tick, tick...."
American shortwave stations WWV and WWVH could go dark next year, due to budget cuts by their parent agency, the National Institute of Standards. Needless to say, this is bad news for anyone who uses shortwave radio or has dabbled in the radio hobby over the past 50 years or more. WWV and WWVH transmit the exact time of day and solar flux information from sites in Fort Collins, Colorado and Kauai, Hawaii (WWVH). They are excellent propagation beacons because of their frequencies: 2.5, 5, 10, 15, 20 and 25 MHz (this last one from WWV only). Each is a harmonic or sub-harmonic of the original 5 MHz broadcast that began in the 1930s while WWV was located in Beltsville, Maryland. My QSL card from WWV in Colorado. In its budget that would begin next July, NIST wants to reduce spending by about $49 million, including savings of $6.3 million by phasing out the shortwave stations and focusing on other work in physics and science. What is equally bad - or worse - this would also eliminate WWVB, NIST’s 60 KHz low frequency station that synchronizes radio-controlled (so-called “atomic”) clocks from a 70 KW transmitter also in Colorado. On the air since 1963, WWVB uses an embedded binary code that has nationwide coverage during hours of darkness, when longwave radio reaches the farthest. A whole industry of self-setting watches, clocks and consumer devices has grown up around WWVB. I own several portable clocks that use the WWVB signal and receive it without a problem each night in Connecticut - 1650 miles from Fort Collins. In 2009, NIST released a guidebook on WWVB time-synced devices, which contains maps and technical details of the system and the amazing coverage of VLF radio. 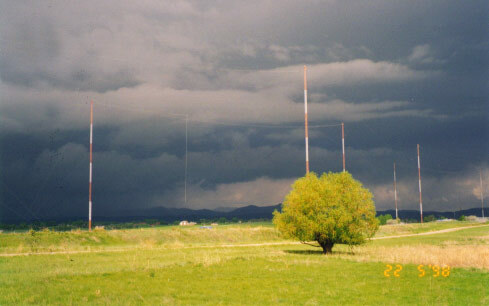 While WWV and WWVB spent their first decades in Maryland, they moved to Colorado in the 1960s, when the U.S. government sprang for a 390 acre antenna site near the Boulder scientific laboratories, which later became the National Institute of Standards. WWVH went on the air in 1948, while Hawaii was still a U.S territory. Voice announcements were added in 1964, on the same frequencies as the mainland stations. Due to weather and beach erosion, WWVH moved to its present location in 1971. How can listeners tell which station they are receiving since the frequencies are identical? WWV has a male announcer, while WWVH has a female. I find there are times of the day and year when both stations come in at the same time on the same frequency. Neat thing is, the announcers don’t overlap – the WWVH female announcement is slightly ahead the male on WWV. The ham radio community has launched a petition drive to preserve WWV, WWVH and WWVB, and it has the full endorsement of the ARRL. Few people may realize that WWV went on the air in its testing stages in May, 1920 - a full six months before American's first broadcast station, KDKA in Pittsburgh. WWV is a proud part of our American heritage and a useful radio utility, so let's fight to keep it alive. For hams who enjoy summer band openings on 10 meters and above, 2018 is shaping up to be a banner year. Here in the northeastern U.S., sporadic E short skip started in early May, and was still going strong on 10 and six meters as June came to a close. If you're obsessed with digital FT-8 and 10 meters (like me), it's been the best of both worlds - keyboard contacts have been possible almost every day on 28.074 MHz, the FT-8 frequency. Most of the signals coming into Connecticut are from the south and and midwest, notably the Carolinas, Florida, Illinois and Michigan, all showing up on the software's colorful waterfall display. During the month of June, I logged about 140 digital contacts, two thirds of them on 10 meters. Ten meter sideband has been hot as well. A quick listen centered around 28.400 MHz finds lots of operators with regional accents, fading in and out in typical sporadic E fashion. Occasionally, European stations have cropped up on 10 meter FT-8, creating quite an American operator pileup. It's become a summer tradition for me to monitor 28.425 MHz, home frequency of the quirky KC4TVZ in Atlanta. Todd, the operator, calls CQ on a recorded voice loop that seems to repeat endlessly. Operating style aside, he provides a dependable beacon for band openings into the southeast. Moving to a higher frequencies, I still hear distant police agencies that use VHF low band, long since abandoned in most of the United States. 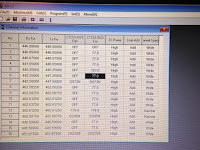 Missouri Highway Patrol crops up in the 42 MHz range, and this month (June) I started hearing the Smyth County, Virginia Sheriff's Department on 37.04 MHz. Several evenings in a row, I heard the same female dispatcher assigning calls in her light southern accent ("Can y'all head on over to..."). Smyth County is rugged and rural, and low band provides more than adequate coverage for the topography. 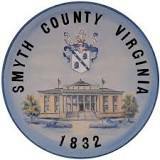 Follow my link here: Smyth County VA Sheriff's Department. Finally, there is FM broadcast radio, where catching E-skip is a happy accident. You have to be listening in the right place at exactly the right time, and luck is as important as skill. During a big sporadic E opening in late June, I came across KKLR-FM ("Best New Country") in Poplar Bluff Missouri - a distance of 1164 miles from my location. Ordinarily, 94.5 FM is home to a low power translator station in Danbury, CT, but not that evening. I listened to the KKLR announcer promote a restaurant and then talk about thunderstorms moving through the Poplar Bluff area, before playing a PSA about preventing opioid abuse. Photo of KKLR reception on my car radio. Click the YouTube link in the text to hear the audio. I'm still keeping an ear on two frequencies - 87.9 and 87.7 FM, both below the authorized broadcast band but popular channels for pirate broadcasters. On 87.7 there is sometimes audio from a licensed LPTV station in New York City, which broadcasts in Korean. This is apparently legal, as the owners are only interested in the audio portion of the LPTV broadcast, which is used as a Korean radio station covering the Big Apple. Six years ago, I wrote an article for a news and features website about the popularity of Chinese import radios among ham operators. Then, the trend was just a few years old and labels like Baofeng, Wouxun and TYT were shaking up the established big three: Kenwood, ICOM and Yaesu, which to that point had controlled the portable and mobile market. Now in 2018, the Chinese import business is bigger than ever, with a dozen or more brands available through eBay, Amazon and ham radio retailers, some of whom are authorized import resellers. On the downside, there are problems with counterfeit radios bearing big-brand names. ICOM has been plagued by fake IC-V8 transceivers that hit the internet market a few years ago and are still proliferating. 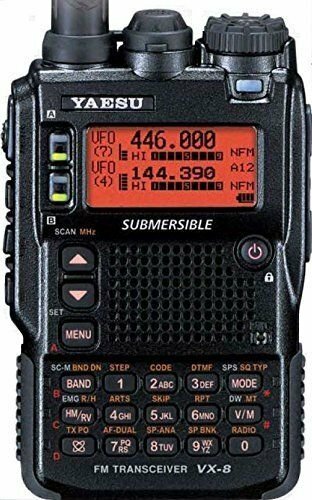 Another Chinese company is marketing the “Vaesu UV-8DR,” a blatant rip-off of the popular Yaesu VX-8DR, a durable, waterproof quad-bander that sells for more than $300. The knockoff costs about $60. 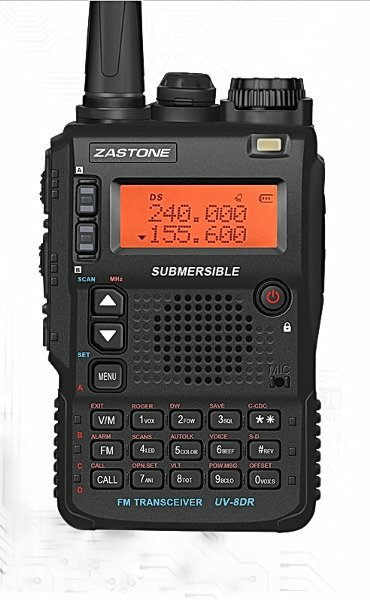 Sketchy practices aside, the import trend isn't going away, Keep in mind amateur radio is a hobby, lives are not at stake (because ham radio isn’t public safety) and cheap radios are wallet-friendly. I know there are purists out there who hate Chinese radios. Sorry. Write your own blog. This time, I invested $19 in a WLN KD-C1, a no-frills 16-channel UHF radio with no channel display and a short, fixed antenna. This radio is sold under several different labels, including the Radioditty R-1, the Zastone ZT-X6 and the Radtel RT-10. I suspect they are all made in the same mega-factory in Fujian Province, China - home of Baofeng and its affiliates. I ordered the radio through eBay April 7 and it arrived nearly three weeks later, April 25, having been shipped from China. I also bought the $6 programming cable. Before I ordered, I downloaded and installed the software, hoping I wouldn’t be stuck with a $19 paperweight. I used the R-1 download from the Radioditty website because of its comprehensive list of software and drivers. My only sweaty palm moment occurred when I plugged the radio into the computer and activated the software, only to get a "device not recognized" message. Eventually, I figured out how to select the proper COM port (COM port#3) and the radio started talking to the software. Prior to installing my frequencies, I uploaded what was already in the radio and was surprised to see frequencies in the 453 and 460 MHz range, which are mostly allocated to business and public safety in the U.S. That makes the KD-C1 illegal to use as shipped, but I bet lots of people buy these radios in pairs to talk to each other, not worrying about what frequency they're on. Channel template for the KD-C1. For my 16 channels, I installed four local ham repeaters, four 70-cm simplex channels, six GMRS/FRS frequencies and two fire departments that use UHF. My intention is to use the KD-C1 with my cross band TYT 9800 and link into 10 meter FM (29 MHz) now that summer season is here and 10 meters will be active. The radio is minimalist in design. There's an on-off /volume knob and up-down buttons on the left side of the unit. A voice announcement (English with a Chinese accent) tells you what channel you are on, and "scan" is accomplished by holding the channel-down button. Charging is done through a mini-USB port, or with the included cradle charger. The KD-C1 uses a proprietary 3.7 volt 1500mAh battery that is slightly larger than a camera battery and spares are available online. I love this radio, but if I had a concern, it would be that the squelch seems a bit too tight and there is no way to adjust it. Receive audio is loud and undistorted, and the radio transmits at two watts - more than enough for my needs. I've been getting more than 16 hours of receive time on a single charge - but that's without transmitting. As everyone is aware, the 2018 Winter Olympics are underway in PyeongChang through the end of the month. For ham radio operators, the games are sort of a medal event requiring unique non-athletic skills - contacting the special event station that is commemorating the games. Korean Special Event QSL card. 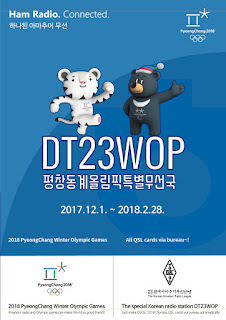 The Korean Amateur Radio League has been operating station DT23WOP (which stands for "23rd Winter Olympics") since December 1, from the capital city of Seoul, and will continue until the end of the games on February 28th, says event organizer, Dr. Sungki Lee, HL1WD. "From Seoul, our station is equipped with IC-775DSP with 500 watts amp into a hex beam (14~28MHz). For 40 and 80M, we are using a dipole. "But as you know, high band conditions are poor. Now our main mode is CW but some FT-8, PSK31﻿ and RTTY," he said. 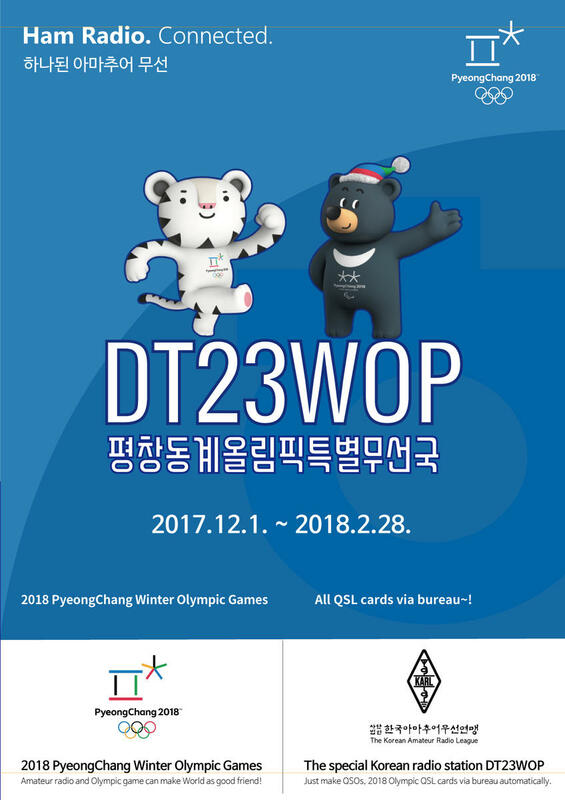 On the DT23WOP QRZ.com page, Lee says the station is using LOTW and that Olympic QSL cards will be mailed from Korea to incoming card bureaus in every country, and there is no need for hams to send their own cards to Korea. Dr. Sungki Lee, HL1WD at his ham station. Blogger's opinion: This is a tough one. Under current solar conditions, daytime contact from the United States (with a possible west coast exception) seems impossible. However, nighttime contacts stand a better chance where there is a path of darkness between Korea and the States. Personally, I'll be watching the spotting sites (such as dxwatch.com, featured on the right side of my page) to see where DT23WOP is being heard. Obtaining the beautiful DT23WOP QSL card is really worth the effort. Lately, I've been scanning like it's 1996. No narrowbanding, no alpha tags, no PL tones and no digital P25 mode. The radio is a Radio Shack PRO-60, a sturdy and selective scanner of the pre-digital era, and one that I especially like. In no time, I had the radio filled with public safety, ham and aviation frequencies, and listened to it in my car or carried it with me. It even made trips with me to the Firehouse Expo in Baltimore, where the police and fire channels never stop squawking. The scanner was well designed - solid and professional, with logically laid out buttons and keypad. On its left side, it had two barrel plug DC inputs - one that bypassed the batteries entirely, and the other that was intended to recharge NiCad AA cells installed in the radio. One day, paying half attention, I plugged the external DC into the recharge jack while using non-rechargeable batteries. A day later when I checked the scanner, the processor was ruined and some of the keypad inputs were shot. Some buttons worked, some didn't, and occasionally the LCD display blinked on and off. To make matters worse, Radio Shack would no longer repair the PRO-60 because in the year 2000, the company claimed it was too old. Drat. I was a victim of planned obsolesence by the people at Tandy Corporation. The PRO-60 shown in the 1996 catalog. So the radio collected dust on a shelf for a few more years, before I finally removed the antenna and battery holder, and tossed the rest of it into the trash. I've had lots of other scanners over the years, digital and analog, simple and complex, but I hoped one day I'd find another PRO-60 and feel better about frying my first one. Fast forward to 2017. Just before Christmas last month, I spotted a near-mint PRO-60 on eBay, from a seller in Ohio who treated it with respect and observed the correct power plug configuration. Four days and $54 later, the radio arrived at my doorstep. 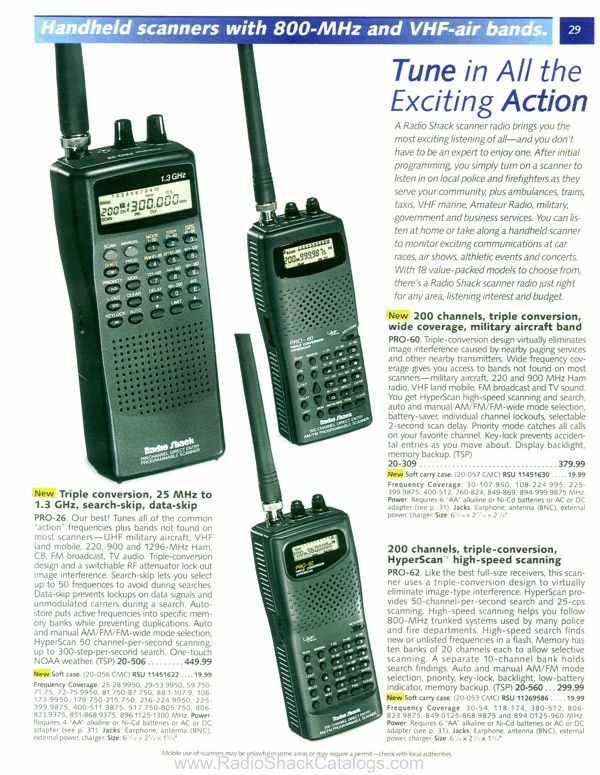 While outdated by today's standards and mostly a collector's item, the PRO-60 still has a lot to offer - a triple conversion receiver (making it immune to most interference), selectable wide or narrow FM, AM for aviation listening, and the 220 MHz ham radio band - a rarity in older scanners. There are still plenty of agencies using analog radio to make the PRO-60 useful, and the audio is crisp and loud. Best of all, I feel vindicated over what happened to this scanner's predecessor, and I'm determined not to make to make the same mistake twice. 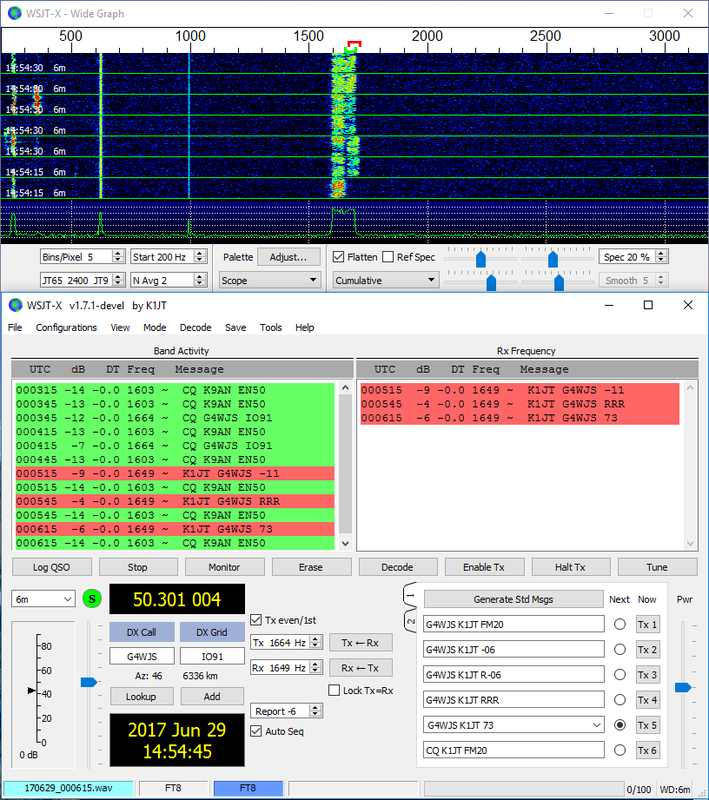 Last fall, my digital mode of choice was JT-65, with its sinister ice cream truck-sounding musical notes and long, tedious turnaround time - the ham radio equivalent of watching grass grow. A year later, I'm obsessed with its offspring, FT-8, also a low power mode suitable for weak band conditions and limited antennas. 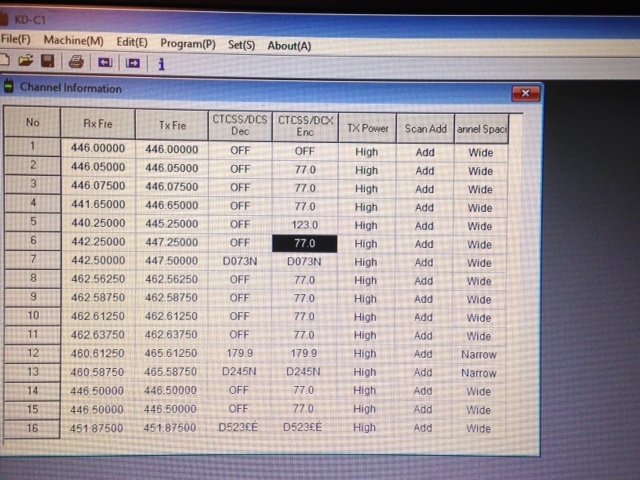 Like JT-65, the information exchange is automated and basic – call signs, grid squares and signal reports (in decibels). What's different? FT-8 uses transmissions that last 15 seconds rather than a full minute, meaning there's less waiting and four times as many contacts can be squeezed into the same amount of time. Since its introduction this summer, FT-8 has caught on like a California wildfire. No one expected this kind of popularity, not even its co-creator, Joe Taylor, W1JT. You only have to look at the FT-8 software waterfall to see how popular it is, as dozens of signals work their way down the display on any band that's remotely open. When operating, you can either call CQ or answer other stations by clicking on them as they appear in the left hand column. A word of advice - FT-8 is very time dependent. Your computer clock has to be accurate to within a second, in order to sync up with other signals on the waterfall. Since my elderly laptop tends to lose time, I have it synced to the National Institute of Standards (NIST) clock, found here. 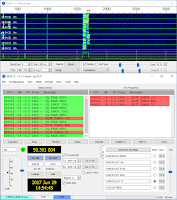 FT-8 is included as part of the free WSJT-X download package, version 1.8.0. There are versions for Windows, Mac and Linux operating systems and other useful information on the page. Admittedly, FT-8 isn’t for everybody. Like JT-65, it’s impersonal and doesn’t allow any real chatting. There are times when I click the CQ button and walk away. When I return, I see that I logged an entire QSO because the software is smart – it establishes contacts and then runs through exchanges and finally sends “73” to the other station. FT-8 allows short free-texting and lets operators work “split” by separating the transmit and receive frequencies on the display. Most contacts are simplex, but dx contacts usually work split – just like regular analog ham radio. Here are the designated frequencies for using this mode: 1840 KHz, 3573 KHz, 7074 KHz, 10136 KHz, 14074 KHz, 18100 KHz, 21074 KHz, 24915 KHz, 28074 KHz and 50.313 MHz. I generally run no more than 10 or 15 watts of output power - more than adequate to make plenty of contacts. I hope this is an informative article, and that some of you give FT-8 a try. As they say in digi-land, see you on the waterfall! One of three ham towers at W1AW, Newington.